Being an “extreme” anything is rarely something to celebrate, but when you could be spending $5 for essentials that you can use for weeks, being an extreme couponer might be the way to go. We’re here to offer some tips and tricks for how to start couponing; you might not become an extreme couponer, but you’ll certainly be on your way to saving. Just like with budgeting, it’s important to understand what you already have, what you use often, and then what you need. Extreme couponing can cross the blurry line into hoarding once you start buying for the price rather than the need. As Jen Avery from Thrifty Nomads suggested in a blog post, block some time off per week to find and sort coupons, and create a plan for use. Think of this as a microhabit to help you save money later. For some, you might already get coupons delivered directly through your mailbox from the retailer, manufacturer or newspapers. Those who don’t get coupons delivered, there’s still plenty of avenues to explore. 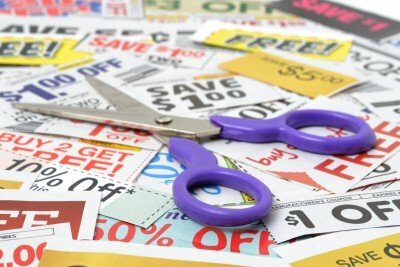 Coupons.com and HotCouponWorld.com are both websites that have consolidated pages upon pages of weekly ads and online deals that you can sift through easily. When you’re taking inventory of what you use, also pay attention to whether there’s a certain brand or store you shop at more often. If there is, consider signing up for the newsletter or ad delivery to maximize on the deals you receive. The blog Live Like You Are Rich also has a post that includes plenty of links for not only finding coupons, but also websites that’ll help you match sales. Saving money sounds great, and that’s exactly what you’ll be doing with couponing, but remember that you’ll be saving money through spending money. With that, don’t get hooked in by one of most dangerous four-letter words: SALE. Just because it’s on sale, doesn’t mean it’s a great deal. This is especially true if you end up wanted to buy it just because it’s on sale. This post from MoneyCrashers recommends taking the time and energy to calculate the end price to truly see if your purchase is worth it. In the same vein, be wary about using a coupon on a full-priced item. Sometimes it’s the only deal available but getting the most out of your coupon means combining your deals. If there’s a sale and you have a coupon that you can use, that’ll give you the best end price. Make sure to not only take time to find your coupons, but also understand the sales offered at the store. Like many other things in life that sound too good to be true, there are some fine print pitfalls to be aware of so you can avoid hiccups at the register. Read up on some terms with a blog post from The Krazy Coupon Lady. This post breaks down common terms you’ll seem in the fine print of coupons, such as the difference between limiting one coupon per purchase and limiting one coupon per transaction. This is hardly a complete guide, but it’s certainly a start to finding resources and learning how to use coupons to their full potential. We wish you happy shopping and plentiful savings as you start couponing!